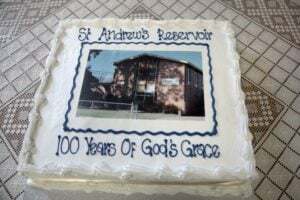 Sunday September 9 marked the 100th anniversary of St Andrews Presbyterian Church, Reservoir (RPC) with an all day celebration attracting more than 250 past and present members plus others who had a connection with RPC. The program included two services, one of which was live-streamed overseas, and a series of interviews with representatives from each decade, starting with the 1950’s. Mrs Gwen Young, our earliest member, recalled being baptised, married, their children baptised, a parent buried, and a daughter married at St Andrews. 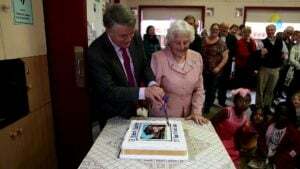 Mrs Heather Fairweather, another early member, cut the cake and recalled busy, happy times over the years. An abundance of food was served throughout the day. The Centenary Committee worked hard to gather photos and memorabilia to create a display for each decade and a time line showing significant developments. They also produced a booklet to continue the story from the 75th anniversary publication. 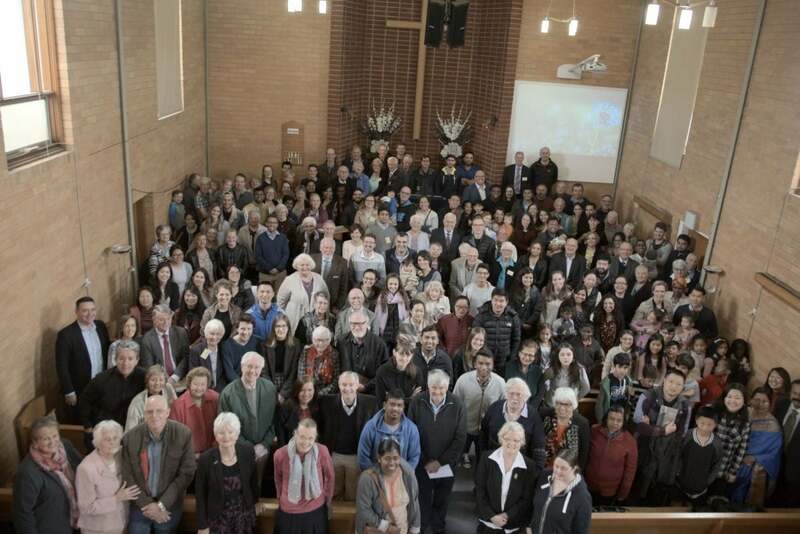 This shows the diversity of today’s congregation with reflections written by 40 people. Over the years RPC has experienced growth and decline, and is currently growing steadily. We have welcomed people from at least 35 countries, and today’s congregation of over 150 reflects the diversity of Reservoir. Since 1970, through our Faith Promise program, we have supported overseas and home missionaries, some of whom grew up in RPC’s youth group. 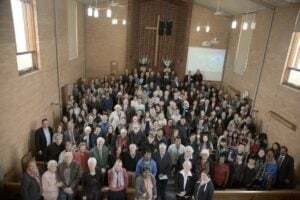 A recent church member, Rebekah Loh, when interviewed, said she noticed on her arrival that there were “lots of old people” at RPC. This has changed with the influx of overseas arrivals through the English classes started by Lois Cox in 2007, and a growing number of La Trobe University students. Some have found us through the church website, and others through Carols on the Lawn. For a while we had no children so no Sunday School (though in the 1950s there were 300 children attending), but now Kids Church runs at two levels, there’s a youth Bible class, and shortly a Play Group is starting. We recently welcomed perhaps our youngest ever communicant member, Tom Vines, and last year appointed our youngest church elder, Isaac Evans, and another, Amir Kashani, who came as a refugee. Preaching in the morning service, the Moderator-General, Rev. John Wilson, once a member of the youth group, later our pastor, and now a returned member, urged us to remember that while it is good to celebrate growth, it is vital to keep the Word of God central, with faith in Christ, and always to do our best to secure the next generation for Christ. Rev. Andrew Vines, our current pastor, preached an evangelistic message at night, challenging us regarding the future of the church in Australia. He expressed confidence that God will continue His work as the Father reveals Jesus to people, as Jesus builds His church, and as His people use His keys. He ended with a final reminder that when we preach the gospel we are using the keys to the kingdom of heaven. A number of those who attended enjoyed catching up with people with whom they’d had a previous connection. It was a wonderful day of giving thanks and glory to God.